Blizzard’s annual community celebration took place over Friday and Saturday. Over 30,000 gaming enthusiasts visited the BlizzCon event this year at the Anaheim Convention Centre in Anaheim, California. There was the usual mix of eSports competitions, developer panels, cosplaying, and exciting announcements from Blizzard about its top IPs. Here is a summary of the most important news. There were two key announcements for fans of WoW. The seventh expansion for World of Warcraft has been announced: Battle for Azeroth. Blizzard says that this expansion focuses upon a reignition of the war between the Horde and the Alliance. Blizzard has published a dedicated microsite for the expansion where you can learn more and watch various video trailers. Another announcement to warm WoW players’ hearts is that “a gameplay experience that recaptures players’ first journeys into the original World of Warcraft,” is being worked upon. WoW Classic will be based upon a ‘vanilla server’, returning to a style of play last enjoyed before the Burning Crusade expansion launched in 2007. Development is in early stages so there’s no official ETA as yet. 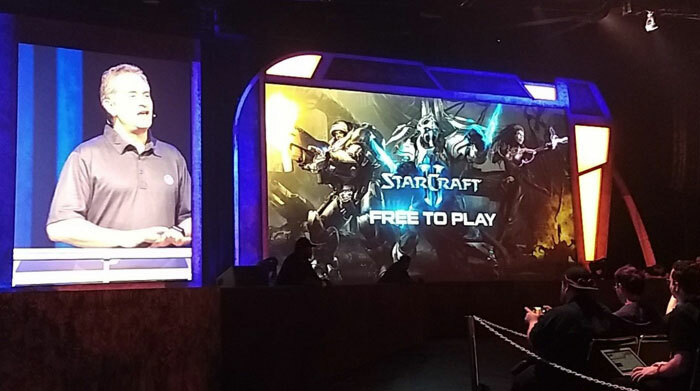 From 14th November, StarCraft 2: Wings of Liberty will be free to play. Those who already own Wings of Liberty will receive the Heart of the Swarm expansion at no additional cost. Single player expansions Heart of the Swarm, Legacy of the Void and Nova Covert Ops will still be up for sale at $14.99 each. A new support Hero called Moira is heading to Overwatch soon. Moira can inflict great damage upon enemies and also work as a healer for teammates. She becomes Overwatch’s 26th playable character. A new map called Blizzard World is coming to Overwatch for all players in 2018. The map is akin to a theme park of popular Blizzard IPs (Diablo, StarCraft, and Warcraft) and players will be tasked to either attack or protect the map payload. A new Hearthstone expansion, dubbed Kobolds & Catacombs, is coming in December. The expansion is described as a “return to the roots of fantasy.” A new single player mode called ‘dungeon run’ will feature. In this mode players face eight random bosses and earn new cards but they can lose all the cards if they don’t succeed in the quest. Coming later this year, two new dragon heroes, Hanzo and Alexstrasza, will bring new and dramatically different styles of play to the Nexus in Blizzard’s fast-paced MOBA. Additionally Blizzard described a 2018 gameplay update with a wider field-of-view camera, new Mercenary mechanics, and other core gameplay updates. Too little, too late. I played WoW for years in the early days, ran my own guild, conquered Molten Core etc and while WoW has improved in ways over the years as it catered for more casual players, I think it lost that edge that made great items difficult to obtain. These days you can trip over and find an epic in your bag. They should have done this years ago. Time will tell how it pans out but I can't see myself returning to it as moved onto other things. Even though saying that I play new expansions when they come out for like a month lol. There's definitely a market, Blizzard have issued cease and desist orders against 2 different player run ‘unofficial’ vanilla servers in the last 12 months. In the second case they stated they wanted to work with the people organising it. This appears to be the result of that work. You could be right but I was talking about my own personal thoughts on it not saying there wasn't a market for it. Was referring that for me it was too little too late.